Which statement best describes phase synchronization as it is used in the backhaul transport? Which quality level will MLS1 deliver to POC2-1 on its Synchronous Ethernet (SyncE) port 1/2/7? wait to drop its peering session with that neighbor router? 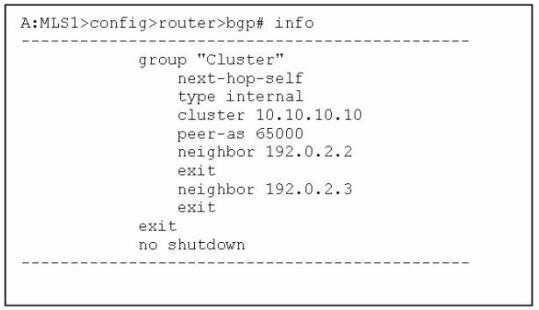 Gateway Protocol (IGP) removes the route to its BGP peer MLS2 system ID? describes the manual bypass tunnel configuration requirement for the ring topology shown? All nodes must have fast reroute facility enabled in the MPLS context. With the information given, why is the second static route to prefix 192.0.2.2/32 inactive? 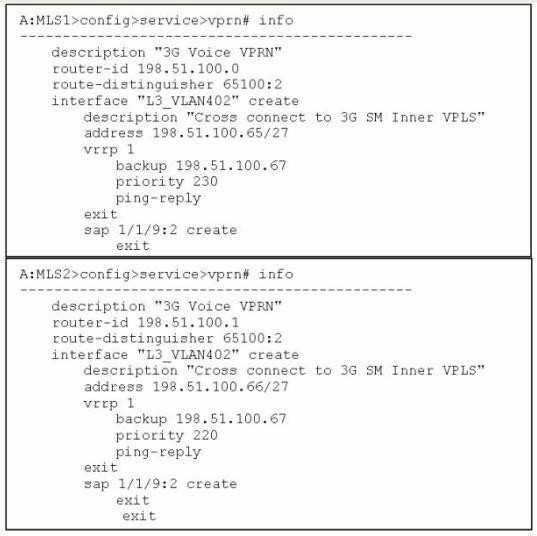 Which command example correctly configures the secondary static route on MLS1? 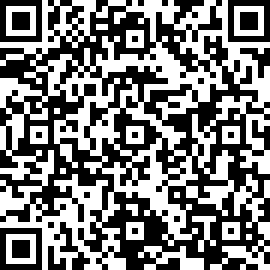 Which statement correctly describes Virtual Routing and Redundancy Protocol (VRRP) configuration? 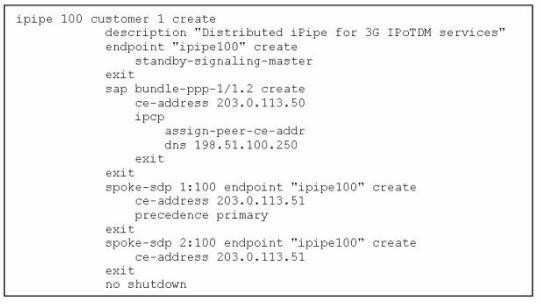 remote Provider Edge (PE) routers. for the ePipe spoke terminations?
. 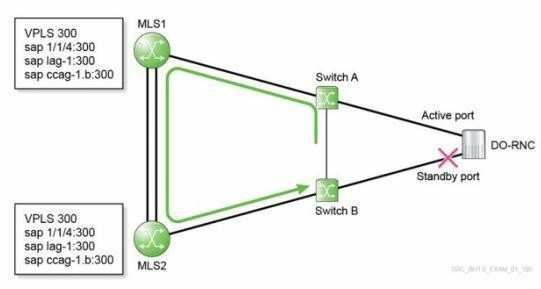 Multilayer Switch (MLS) 1 and 2 host duplicate Virtual Private Routed Network (VPRN) services. master interface fails and recovers, they want traffic to remain on the VRID backup interface. 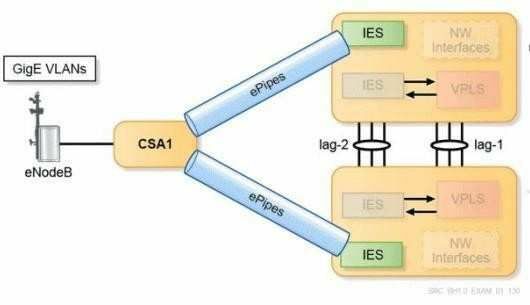 Spanning Tree Protocol (STP) on behalf of VPLS 300. 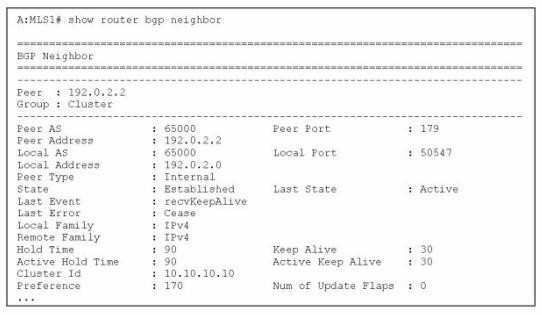 What must you configure on the MLS routers? Which statement correctly describes SROS Virtual Private Wire Service (VPWS) endpoint characteristics? 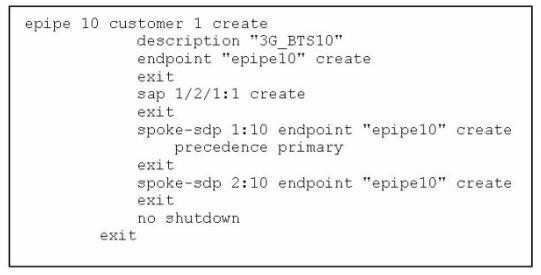 Upon startup, which pseudowire status value will the local PE router signal for the standby spoke SDP? Which statement correctly describes the iPipe service operation?